“One doesn’t need only food for living - there are many other requirements for leading a good life. 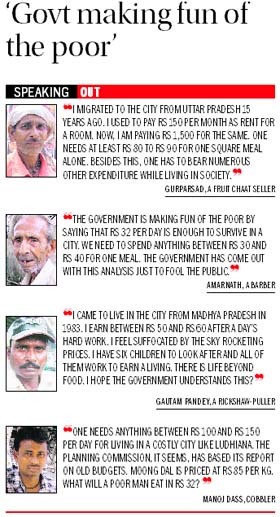 If we analyze the figures given by the Planning Commission it seems as if they are based on the food requirements of the residents of Bihar and eastern Uttar Pradesh. A portion of the Pakhowal road near Feroze Gandhi Market caved in due to lying of cables by a contractor of a private company today morning. There was not much traffic on the road otherwise the extent of damage could have been more. In the course of income tax survey on two groups of steel manufacturers here, which continued till late last evening, Rs 7 crore worth of concealed income was surrendered. Although the Planning Commission has set Rs 10-12 as the minimum daily per capita income, this figure is far removed from ground reality. According to the panel one needs only Rs 61.30 for clothing, 99 paise for education, Rs 9.60 for shoes and slippers and Rs 28. 80 for makeup. 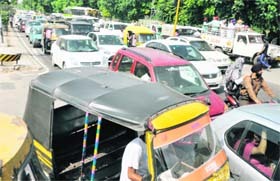 City residents suffered a harrowing time on Thursday with the traffic on the entire stretch of the arterial Ferozepur Road, starting from the Nanaksar gurdwara to the Maharaja Regency Hotel, jammed for three hours due to the ‘Kisan Mela’ (farmers fair) held on the Punjab Agricultural University campus grounds. 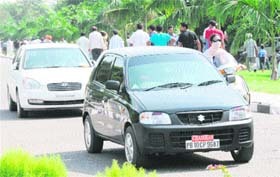 Though the administration had made elaborate security arrangements and the police was keeping a vigil on the Punjab Agricultural University campus, massive traffic violation was witnessed on the campus on the first day of the Kisan Mela 2011. Hi-tech melas are a source of knowledge for farmers with the advent of various technologies and their ostentations. Guru Angad Dev Veterinary and Animal Sciences University inaugurated its 11th Pashu Palan Mela with the theme “Utpadan di gunvatta vadhao, Pashu palan ton vadh labh pao” (earn more profit in livestock farming by adopting value addition practices). 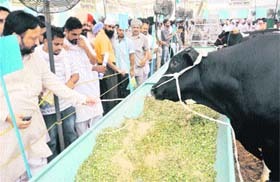 Farmers were amazed by the healthy cattle brought at the Pashu Palan Mela on the GADVSU campus here today. However, they asserted that they could not afford such cattle. “The university receives government aid and they employ two to three persons to take care of every cattle. We have to take care of 10 cattle with limited financial assets,” said a farmer. 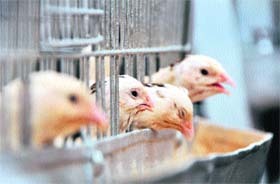 Even as the domestic bater (Punjab white quil) attracts non-vegetarians at the Pashu Palan Mela of Guru Angad Dev Veterinary and Animal Sciences University (GADVASU), they fail to purchase the same as it is not readily available for purchase. Three bogies of a goods train were derailed near the Dhandari railway station on the Ludhiana-Delhi route while the train was on its way to Dhuri at around 1 pm today. 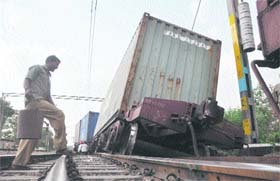 The train was loaded with containers carrying goods for export. The situation became tense outside the house of Health Minister Satpal Gosain this afternoon after about 170 auxiliary nursing midwives (ANMs) clashed with the police while protesting against the state government's “callous” attitude in implementing their pending demands. The ANMs raised slogans and burnt an effigy of the Health Minister. The District Congress Committee (DCC), Ludhiana (Urban) has expressed concern over the deteriorating law and order situation in the state, particularly in this district. The DCC criticised the civic administration for its “failure” to provide basic amenities like the clean drinking water, drainage and roads to the people. The sale of liquor and non-vegetarian food has dipped in the city due to shraadh. People ritualistically pay obeisance and remember their ancestors during this 15-day ritual. They abstain from shopping, drinking and living for themselves. No marriages are solemnised and people avoid doing auspicious things, including giving matrimonial advertisements during these days. Actor Kabir Bedi’s mother was a regular contributor to The Tribune during the 1930s and the 1940s. Bedi said this while talking to the media here today. He said his mother was an active member of Mahatma Gandhi’s Satyagraha Movement. 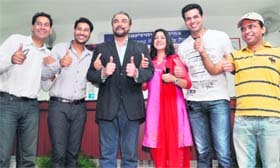 Bedi, along with actor-singer Harbhajan Mann, was in the city for the promotion of Punjabi film “Yaara O Dildaara”. In order to prevent copying in board examinations, Punjab School Education Board has installed CCTV cameras in the schools near the border areas. 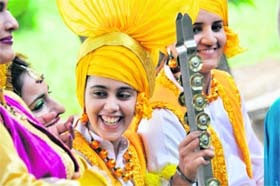 “It is the first time that CCTV cameras have been installed in border area schools near Amritsar to prevent copying,” said Suresh Tondon, vice-chairman, PSEB, who was in Ludhiana to attend Teachers' Day function organised by the Alumni Association of Gujranwala Guru Nanak Institute of Management and Technology (GGNIMT) at the institute here on Thursday. On the second day of the Zonal Youth and Heritage Festival at Government College for Women here today, the students participated in various competitions. A Talent Hunt week was organised in Doraha College of Education from September 17 to September 22. Students showcased their talent in different items like fine arts, creative writing, literary items, musical, dance and theatre. Students showed enthusiasm by participating in various items. A four-day faculty development programme (FDP) organised by Panjab Technical University (PTU) concluded here today at RIMT IET Campus, Mandi Gobindgarh. More than 60 faculty members from nearby colleges participated in the programme. Shuttlers from Ludhiana district gave a stupendous performance to mark their presence in the Punjab State Senior Badminton Championship held recently. Upcoming, Steffi Kala along with Anand Tiwari and Raj Kumar swept four titles. Steffi, who is still a junior, excelled to bag two titles. Gurdaspur toiled hard to outperform hosts Ludhiana 7-5 in the girl’s final of the 16th Junior Punjab State Softball Championship being held at Ramgarhia Educational Complex, Miller Ganj, here today.